WASHINGTON — President Donald Trump on Sunday condemned a “mindless CHEMICAL attack” in Syria that killed women and children, calling Syrian President Bashar Assad an “animal” and delivering a rare personal criticism of Russian President Vladimir Putin for supporting his regime. Just over a year ago, Trump ordered dozens of cruise missiles to be fired at a Syrian air base after declaring there was no doubt Assad had “choked out the lives of helpless” civilians in an attack that used banned gases. White House advisers said at the time that images of hurt children helped spur the president to launch that air strike, and cable news on Sunday was flooded with similar depictions of suffering young Syrians. Saturday’s attack took place in a rebel-held town near Damascus amid a resumed offensive by Syrian government forces after the collapse of a truce. 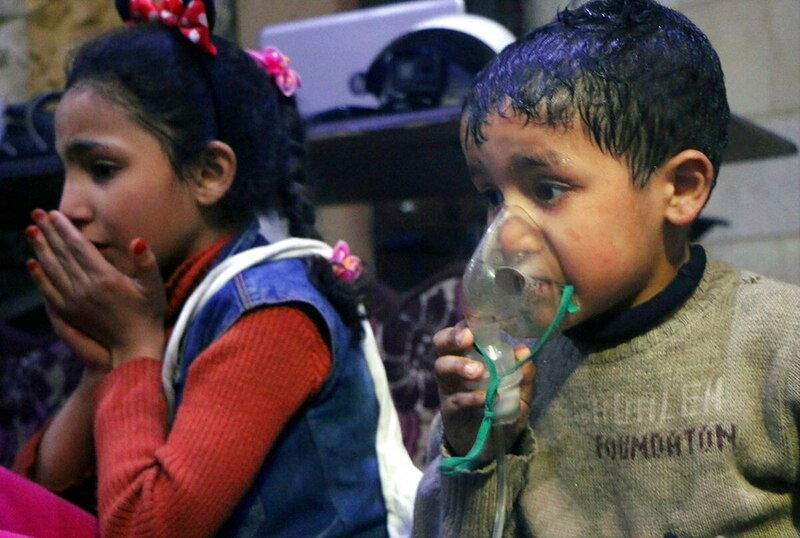 Syrian activists, rescuers and medics said a poison gas attack in Douma killed at least 40 people, with families found suffocated in their houses and shelters. The reports could not immediately be independently verified. Trump was briefed about the attack by his chief of staff, John Kelly, officials said. Trump’s homeland security adviser, Thomas Bossert, noted the timing of the suspected chemical attack — almost a year to the day of the U.S. missile strikes. Vice President Mike Pence on Sunday deemed it a “likely chemical attack” and reiterated Trump’s threat that consequences would be coming for those responsible. Trump’s decision to single out Putin in his tweet appeared noteworthy, as the president has long been reluctant to personally criticize his Russian counterpart. Even as the White House, after some delay, moved to enact tough new sanctions on Russia in the wake of its election meddling and apparent poisoning of a former spy on British soil, Trump left it to others in his administration to deliver the rebukes to Moscow. Trump also invoked Iran in his tweet, continuing his attacks on Tehran while signaling that he may scuttle its nuclear deal. The president has often laid some blame on his predecessor, Barack Obama, for Assad’s continued grip on power after years of civil war. “If President Obama had crossed his stated Red Line In The Sand, the Syrian disaster would have ended long ago! Animal Assad would have been history!” Trump tweeted Sunday.